Share some love with the gorgeous combination of raspberries and chocolate. 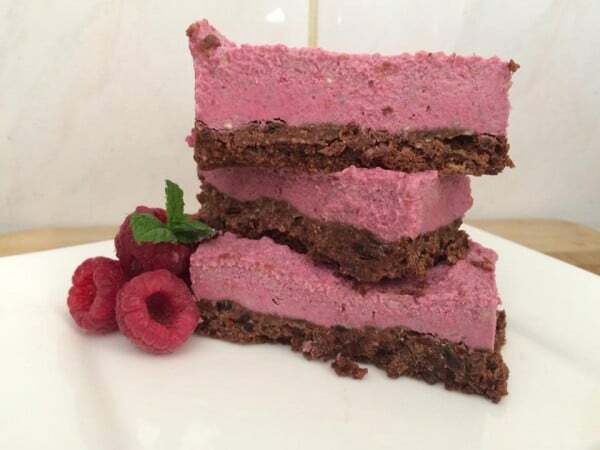 Just 10 minutes work will give you this luxurious vegan treat, perfect for spoiling yourself or someone special! Gluten free, dairy free, refined sugar free, and easily made nut free if required! Combine ballbag contents and oil/water and press into a 20cm square tin or loaf tin. Chill in fridge while you make the raspberry topping. Place the cashews (or sunflower seeds) in your food processor and blitz until a meal consistency. Add all other filling ingredients and process until smooth. Pour into prepared base, smooth top and refrigerate or freeze until set.